Guided by the tower of St Sampson’s Church I have arrived at Cricklade. The name means “place of the river crossing”. The town lies just off the old Roman road that was known as Ermin Street which connected the old towns of Newbury and Gloucester. The ground hereabouts in those days was nearly all wetland and could only be crossed with great difficulty. Roman engineers built a raised causeway to cross the marshes, and a settlement was formed on the south bank of the crossing. The settlement continued to grow after the departure of the Romans. It became a Saxon “New Town”, so in its own way it is much like an earlier version of Milton Keynes only without the roundabouts. 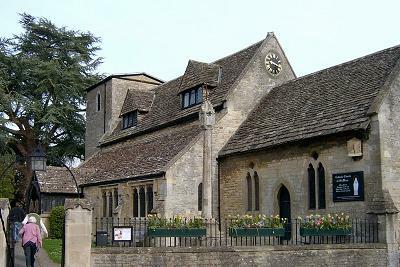 Cricklade became a full Saxon Borough in 887. King Alfred formed a garrison here to protect Wessex against marauders, so greatly increasing the local population. Records show that up to 1500 men were stationed at Cricklade to protect the Wessex homeland. An indication of the importance that Cricklade held in those far-off days was that the town possessed its own mint. Coins were struck here from 979 until 1100 and some of the coins can still be seen today by visitors to the local museums. In 1821 William Cobbett visited during his travels and described Cricklade as “a villainous place”. Quite how he could have described this peaceful and quiet town in such terms is a mystery. A tranquil air is much in evidence even on this relatively busy Saturday afternoon as people go about their weekend. For some distance from Cricklade the only sign that a town may exist at all was the sight of St Sampson’s tower. This cathedral-like tower was added to the church by the Duke of Northumberland (who was the Father-in-Law of Lady Jane Grey), in 1553. Inside the tower one can find, somewhat surprisingly, the heart, club, diamond and spade of a pack of playing cards. This has caused some historians to form the opinion that the building of the tower was financed by a successful gamble. 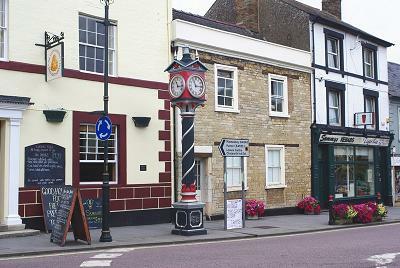 I take a short diversion from the marked path to take a look at the rather splendid “Jubilee Clock” that stands by the road junction at the top of the High Street. The white-faced clock sits in a striking red cube supported by a black column adorned with a white spiral decoration. It was put here to commemorate the Diamond Jubilee of Queen Victoria in 1897. A little further along the street I come to the much restored early Norman St Mary’s church. This is considerably older than St Sampson’s, and in 1983 was re-consecrated to a Roman Catholic Church, making it officially the oldest church used for Catholic worship in England. A fine 14th Century preaching cross stands in the churchyard. The Town Bridge marks the official start of navigation on the River Thames. (Or the end if you are travelling upstream). It may not look it now, but up until 1830 there was a thriving wharf here that was believed to have existed since Roman times. Whilst this is the official limit of navigation, the impracticality of moving any boat through these waters is obvious even to me, because the river passing under the Town Bridge is still little more than a brook. I have reached the end of my journey for day one. The next stage of the walk will take me on to Lechlade, the highest practical point for navigation on the Thames. Between here and there the waters will be swollen by a succession of tributaries, and it will be a very different river by this time tomorrow.